After days and weeks of holiday feasting, we’re always left feeling a tiny bit remorseful for all the calories we managed to down. It even gets to a point of questioning how it all happened. As if you didn’t notice all that sugar and savory treats literally disappearing in front of your eyes via your sweet little mouth. But what can you do? It’s the season for celebrating, wining and dining with family and friends. The world doesn’t expect you to be a hermit and avoid everyone, right? Right. So now that it’s gradually going back to regular programming, we try to go a notch down on cholesterol, sugar and calories. 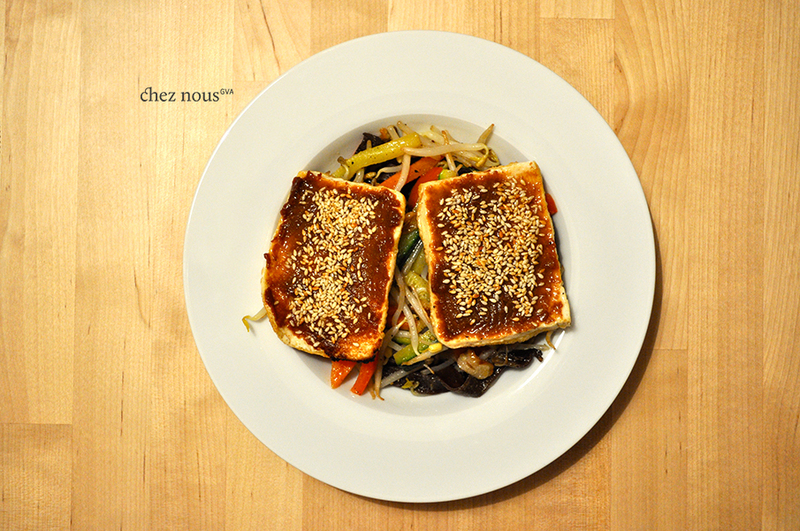 So as not to forgo the tasty food (and fall into withdrawals), here’s a lovely tofu dish that I absolutely adore. In a small wok, heat the oil over medium to high heat. Sauté the shallots until semi-transluscent, and add the garlic. Sauté until garlic is a bit brown. Add the courgette, bell peppers and carrots on the wok, and pour in the fish sauce. You can add a bit of water (1/4 cup) just to have a bit of sauce and to help cook the veggies evenly. After 3-5 minutes, add the mung bean sprouts, mix and turn off the heat. Add a bit of pepper and splash some sesame oil over the stir-fry for that aromatic goodness. In a flat frying pan, put oil (enough to cover 1-cm height) and heat on medium. Dab the tofu slices with paper towel to make sure all water absorbed by the tofu is gone. This prevents that dramatic frying moment when oil splatters everywhere in your kitchen. Mix the miso paste and rice vinegar, then spread the mixture on top of the tofu slices. 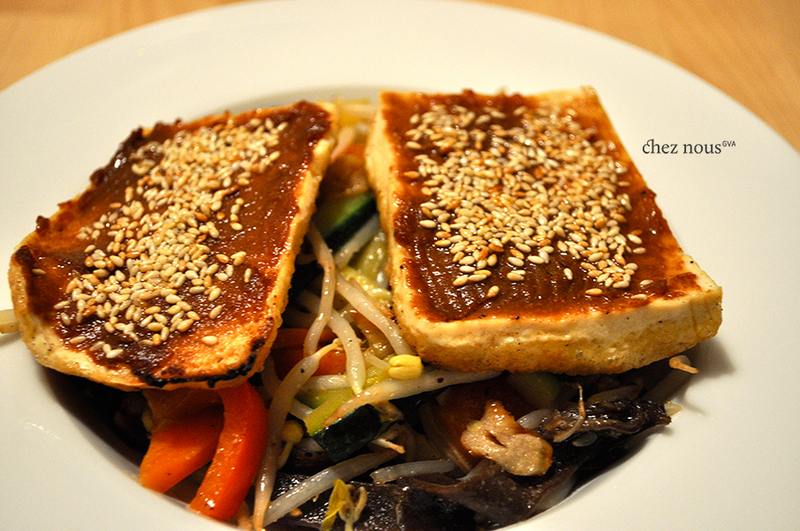 Slide the tofu slices into the frying pan and leave to cook until tofu is golden brown. Remove the tofu slices from the pan, and lay on paper towels to let the excess oil drip. they look sooo cool, i can even like it..
generally, i think i will never make peace with tofu :)) it feels like i am biting void.